Arthur Hiller’s The In-Laws is a film that starts with two sets of parents meeting for the first time ahead of their children’s impending marriage. Sheldon Kornpett (Alan Arkin) is the father of the bride. He is a respected New York dentist – a straight-laced and very serious man. Vince Ricardo (Peter Falk) is the father of the groom. He on the other hand is a shady businessman, who we first meet orchestrating a heist on a US Treasury van. I don’t need to know anything else at this stage. I’ve seen enough movies in my life to know exactly what I’m going to get from the rest of this film. A classic comedy of warring families; a clash of class, ideology and politics, a few scenes of slapstick pratfalls, maybe even a fist fight in the third act before the two dads finally bond, just in time for a happy ending at the wedding. I’ve got no problem with that. This is a film I’m going to enjoy watching. However, that is not what happens at all. This is a film that takes a familiar setup for many a Hollywood comedy, and ends up in Central America with the two main characters facing a cartel firing squad. I won’t reveal how the film gets there, as that is part of the fun of this delightfully insane madcap caper. Soon after they first meet, Vince tells Sheldon he is a CIA agent, and then intentionally involves him in a federal crime. At this point, we the audience are asking the same questions as Sheldon. Is Vince really CIA? Could he just be a career criminal and conman? Or is he actually a crazy person? There’s really no time to ponder the answer, as Hiller’s pacy direction has the two of them carried away from one adventure to the next. Arkin and Falk make a terrific double act. They are the quintessential buddy comedy duo. Arkin is the straight guy, uptight and angry, and always on the verge of losing his temper. Falk however, the instigator of all this mayhem is laid back, cool and deadpan. None of this phases him. Even when they encounter a deranged despot who paints lips on his hands to do a ventriloquist act, Falk takes it all in his stride. Not everything in the film works as well as the two leads however. The style and tone of the comedy veers wildly, and as such can be quite distracting. As a screwball farce it is an absolute delight, but when the silliness swerves into spoof territory it sadly falls flat. It’s a minor critique of a film that is so blazingly original it can hardly keep up with itself. 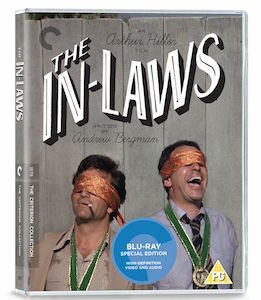 The In-Laws is a wild, untamed piece of 70s cinema. Consistently surprising, full of unexpected twists, and with the kind of plot developments you would find in the novels of Don Winslow and James Ellroy. There’s a decent collection of extras on the disc, including a commentary with Hiller, screenwriter Andrew Bergman, and stars Alan Arkin and Peter Falk. There is also a brand new interview with Alan Arkin, and a featurette with the supporting cast reminiscing about the film.